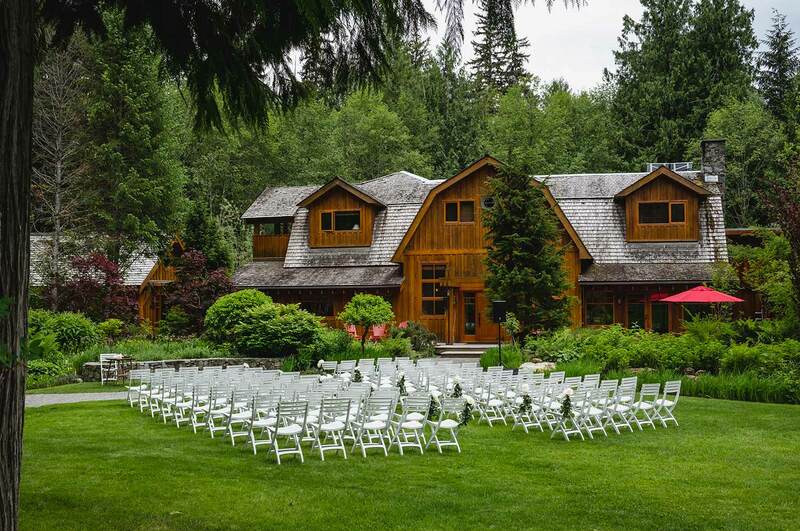 When you say “I do” here, you and your guests are literally surrounded by acres of rainforest wilderness—ferns, cedars, fir and flowers. 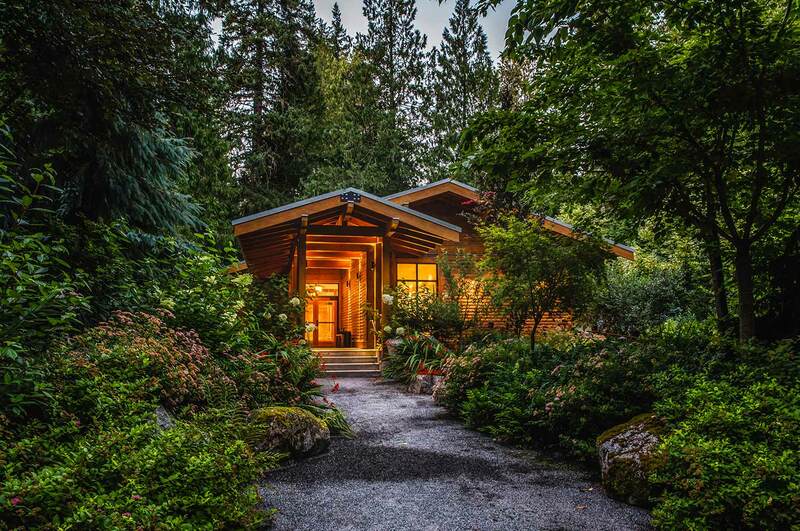 It’s serene, beautiful and exclusive. 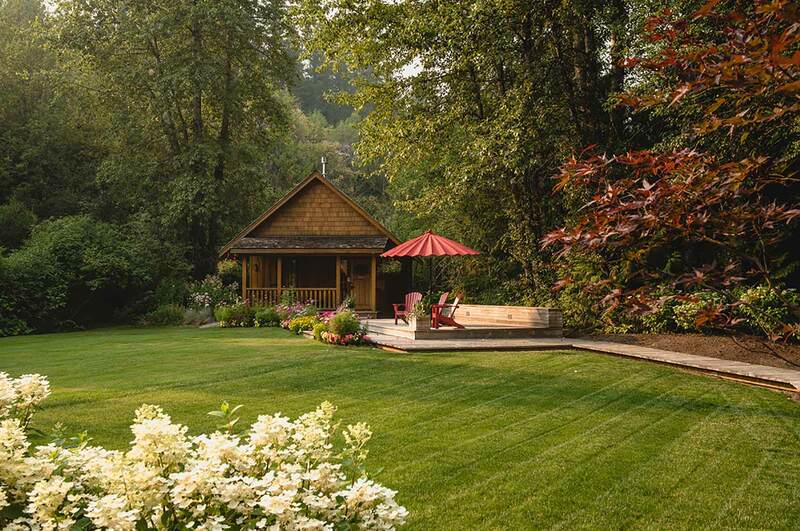 Match your style and ceremony to the many inviting nooks and bowers around our artfully landscaped property. 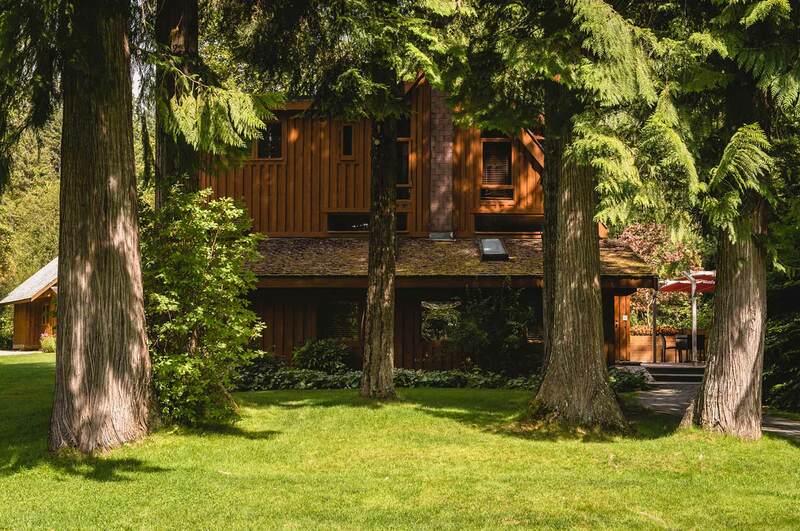 With a Zen-meets-Frank Lloyd Wright vibe, this is one of our two crown jewels—an exquisite, cathedral-like space. 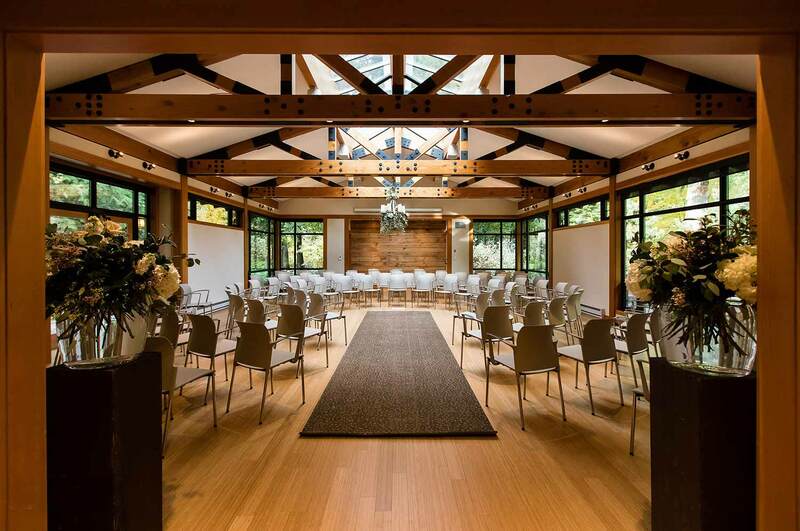 Designed for deep-thinking sessions and intimate, sacred ceremonies, The Gathering at Brew Creek commands reverence with its vaulted post-and-beam ceiling, hushed acoustics and forest backdrop melding the inside and outside worlds. 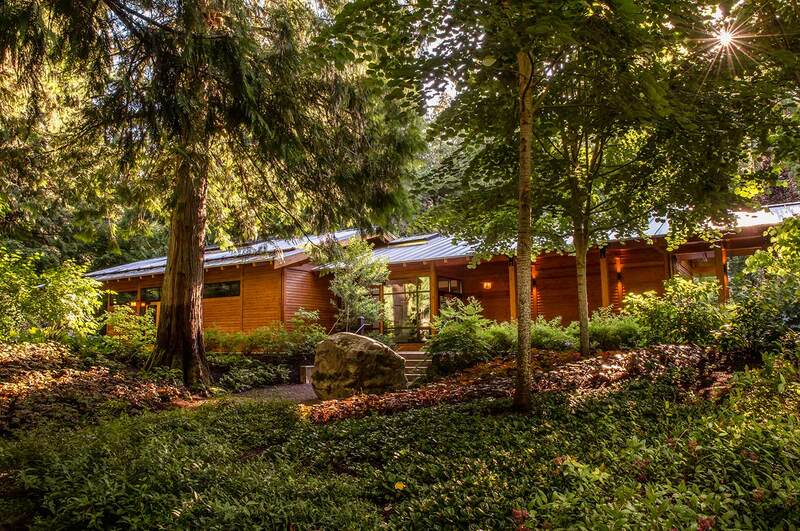 Flooded with natural light, it overlooks a moss and fern garden. It’s constructed using the greenest standards, including high-efficiency heating and state-of-the-art insulated windows. 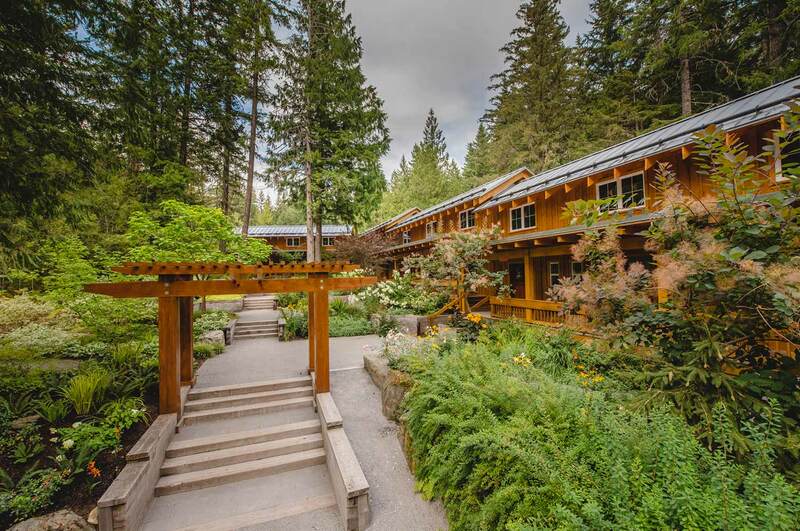 Our most popular spot, this quarter-height stone wall frames a natural alcove in front of our historic main lodge. 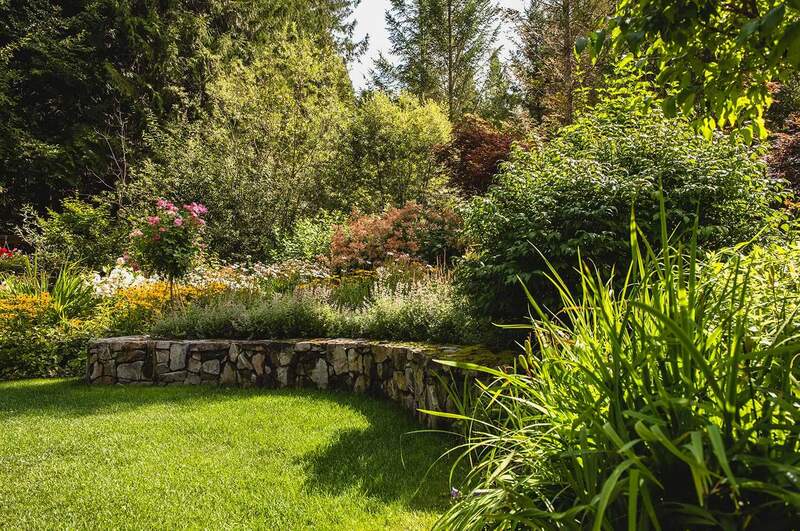 It’s surrounded by our most densely planted, colourful flower gardens frequented by butterflies and humming birds. Revealing peekaboo views through the trees, the bride proceeds across an elegant timber frame bridge and on to the south-facing, sun-drenched lawn. Purple maples frame a serene picture enhanced by the lush forest and creek backdrop. Family and friends watch through the cedars as the bride walks across a post-and-beam bridge adorned for the occasion, over the creek and to the south lawn where they are gathered in anticipation of her arrival. 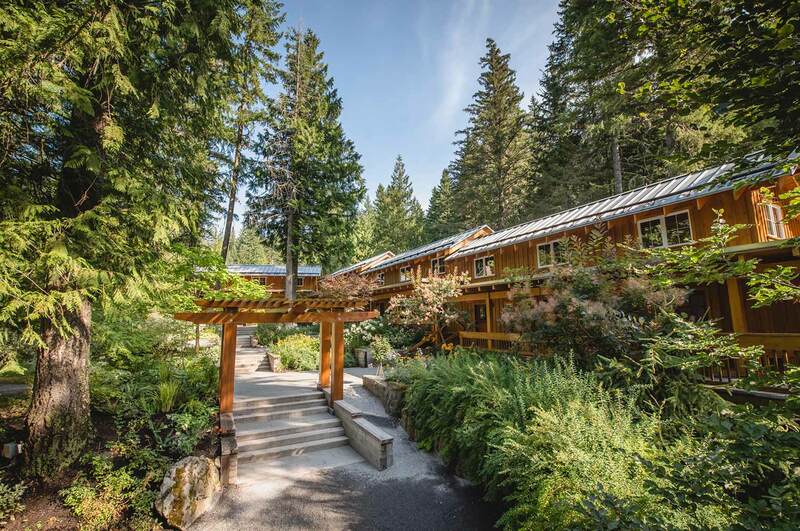 The Guest House Arbor is a natural arch of towering old growth cedars that creates a picture-perfect half moon around the bridal party. 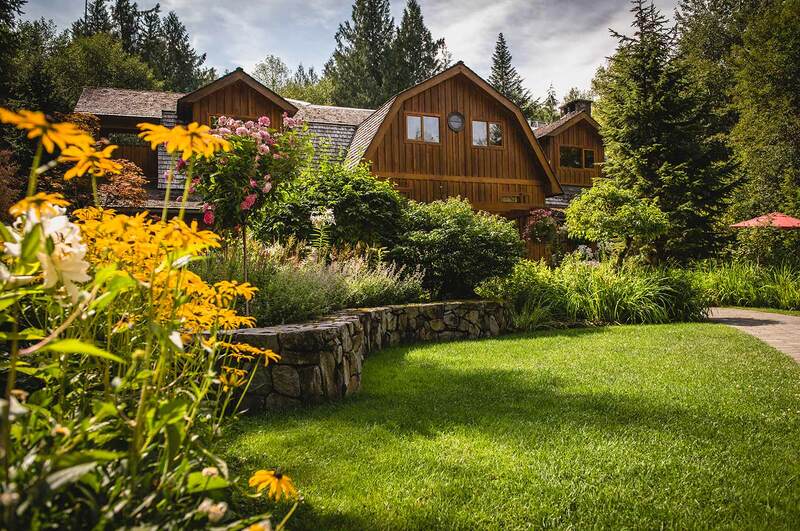 It feels forested, but is still close the main lodge—and just steps away from hors d’oeuvres, the bar and lawn games. It’s also shaded for the bridal party. 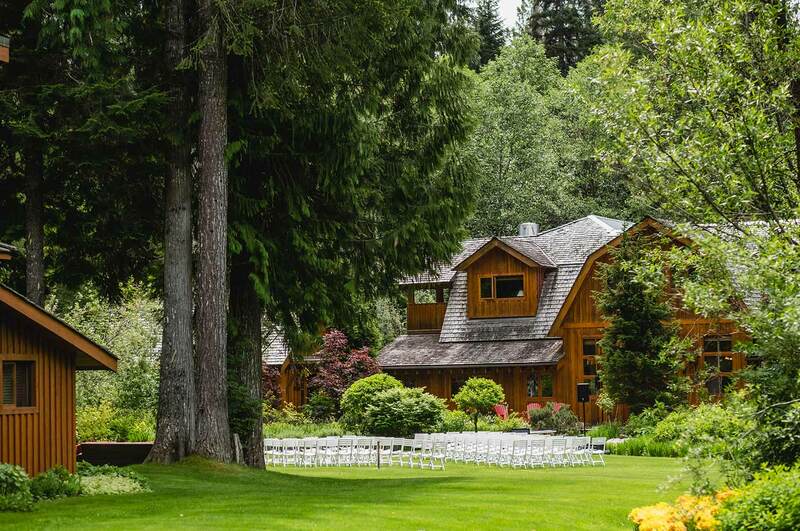 Guests see the bride through the trees as she comes across a wooden bridge on to the south lawn with the charming, woodsy Guest House as a backdrop. 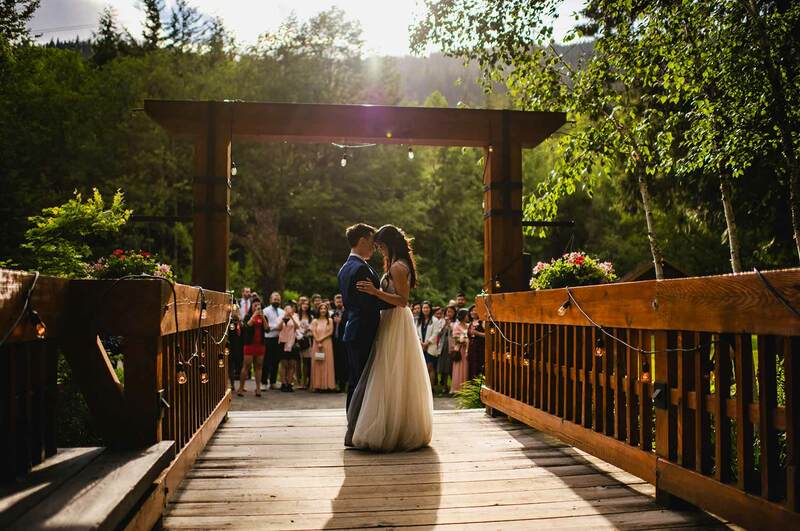 This is a new favourite: The bridal party emerges from the Trapper’s Cabin, a Brew Creek original with a vintage stained glass-adorned wooden door, and on to the sunny south lawn. Couples exchange vows on a raised boardwalk prow (outcropping) for two surrounded by gardens, with a lush forest and creek backdrop. 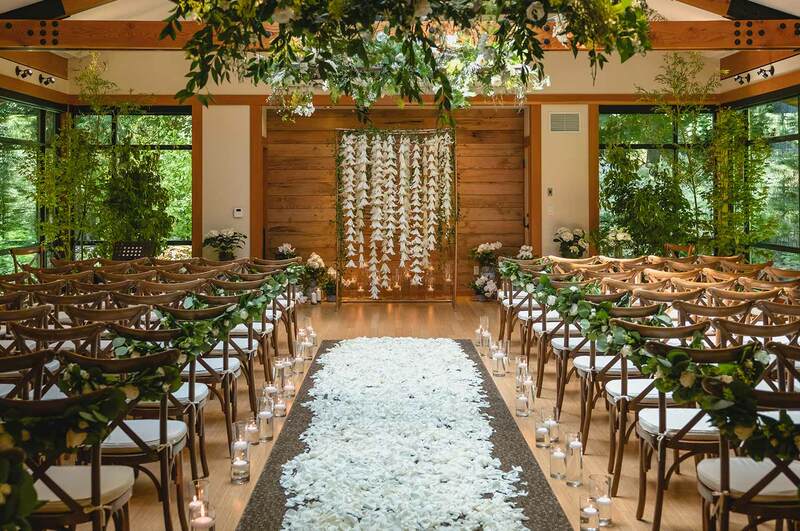 The Trapper’s Prow option clearly separates the ceremony from the cocktail hour, and guest can stroll together after the ceremony to the celebration venue. 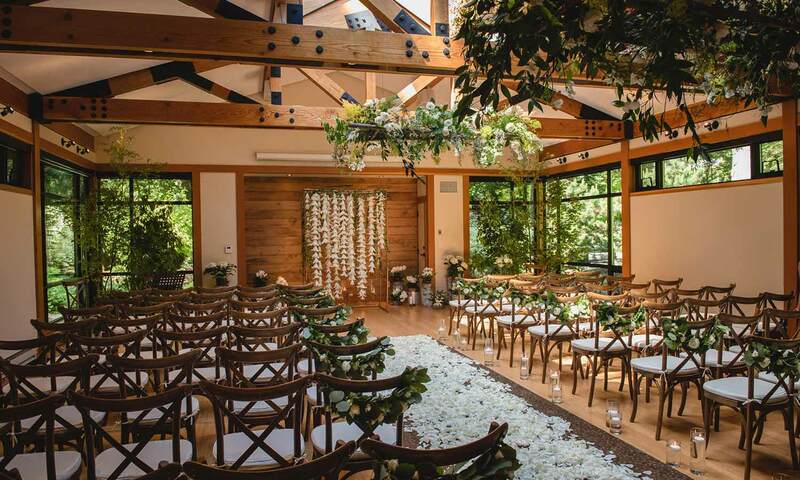 Guests can gather casually along the surrounding deck to watch as the bride descends tiered terraces separated by a canopy of towering trees and gardens down to an oversized wooden arch, adding drama to the entrance. This partially shaded area creates a natural amphitheatre. The couple can lead a champagne toast after the ceremony, and a celebratory procession through forest trails back to the south lawn for cocktails and canapés. 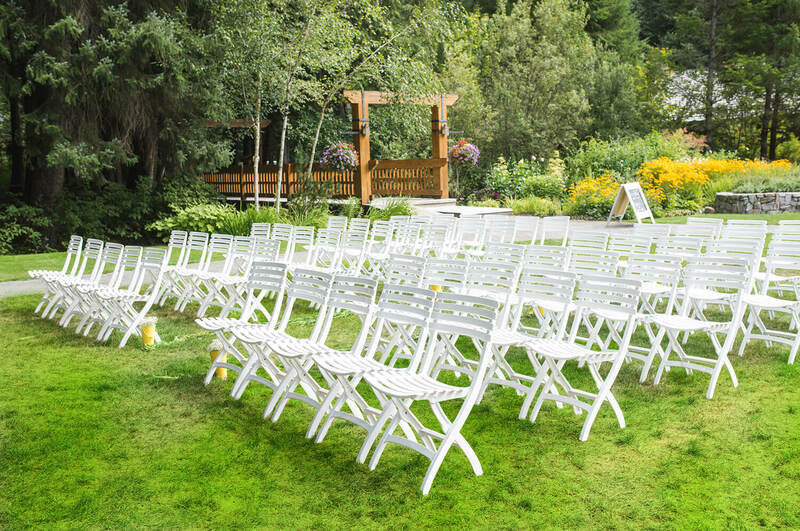 Please note The Brew Creek Centre is a full service, destination wedding venue only with accommodation provided on site. 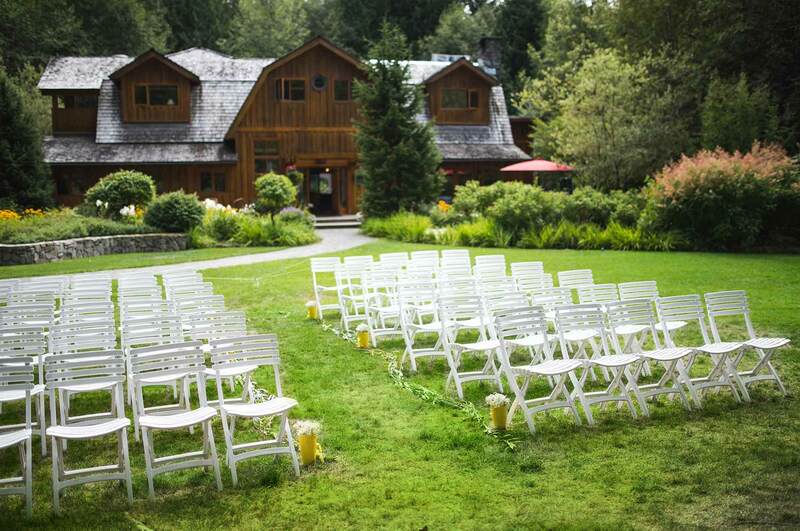 Our wedding packages reflect a two night stay or more.